Cheese based dips, buttermilk dressing, sour cream cheese cakes—these are food traditions that feature fermented dairy products and are time-honored treasures in dairyland regions like southern Wisconsin and upstate New York. Think of them as cultural expressions of cultured dairy foods. Clearly Patti is someone who knows a good dairy recipe when she sees one. 1. Heat oven to 350 degrees. Meanwhile, cook chopped bacon in skillet until crisp. Drain bacon on paper towels and wipe out the skillet, leaving just enough bacon fat in which to cook the garlic. 2. 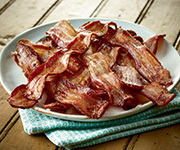 Return bacon to the pan and add garlic; cook until garlic is tender—be careful not to burn it. Drain the garlic and bacon on paper towels. 3. Beat the softened cream cheese in a bowl until smooth. Add heavy cream, blue cheese and chives and beat well. Fold in the bacon-garlic mixture. 4. Transfer mixture to a small baking dish and sprinkle with almonds. Bake 25–30 minutes. Serve hot, with crackers or cut-up veggies.